The apocalypse seems to be on everyone’s minds these days. Whether it’s a Mayan countdown, an economic meltdown, or a zombie hoedown, people are prepping for it, stressing about it, or watching movies about it. There are countless books and websites popping up telling you how to create an evacuation plan, what to pack in your bugout bag, and what type of scattergun or machete is best for defending your cache of dehydrated biscuits. But few people seem to be asking the most important question of all: On the day after, where will you go for a drink? 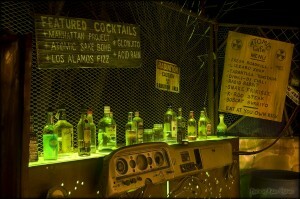 Artist Adam Chilson has set out to answer that question, by creating the ultimate post-apocalyptic backyard bar. 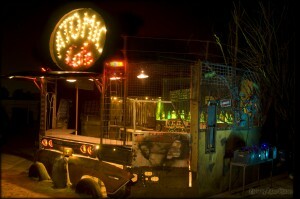 Built from a combination of scrap metal and car parts, the bar is durable, functional, and Mad Max-beautiful. 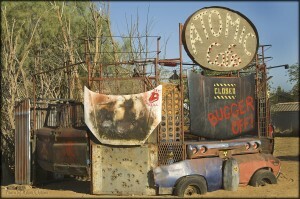 In fact, the whole creation was inspired by the “Atomic Cafe” in the movie Mad Max: Beyond Thunderdome. (The sign over this real bar is a dead ringer for the one in that film, but the rest of the design is all original). Chilson and a team of dedicated volunteers assembled the bar on his desert property outside Los Angeles. And while the entire construct may look haphazard and ramshackle, that’s all part of the illusion. In reality, the bar is very solid and carefully planned out, with new steel forming most of the framing and scavenged, rusted metal used as decorative skin. Each component is custom-welded so that the entire apparatus slides and locks together without tools. 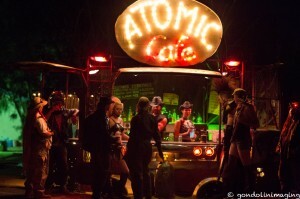 The modular nature of the construction was important, as the entire bar will be transported and reassembled at the Wasteland Weekend festival in September, 2012 (Chilson is one of LA based fest’s head organizers). After that event, the bar will be available for other occasions. Each component of the bar was limited to no more than eight feet long, so that everything can be transported in pickup trucks. And though the innards all snap together like clockwork, Chilson wanted an asymmetrical, chaotic look for the exterior, so after the basic framing was laid out, he gave separate build teams the task of skinning each exterior wall, knowing they’d all go in a slightly different creative direction. The bar is roomy enough to accommodate four bartenders, with two working the main window, and one each at the side windows. 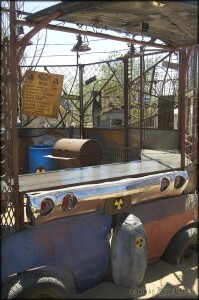 The side ports (one of which is an actual car window) can be sealed shut when serving smaller crowds, and the whole bar can be locked down by sliding various metal grills into place and closing the car hoods that otherwise serve as canopies (it gets hot and sunny in the wasteland, so shade for patrons and bartenders was an important consideration). The surface of the bar top itself is polished new steel with ample custom shelving for bottles and barware underneath. 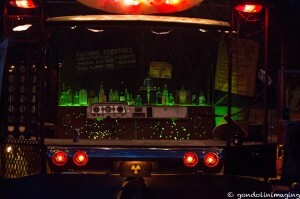 An illuminated back bar for display bottles and “top shelf non-radioactive liquor” uses the entire dashboard of a 1965 GMC flatbed (and yes, the AM radio still works), while the saloon-style doors providing access to the “employees only” area are made from the doors of a vintage Chevy pickup. 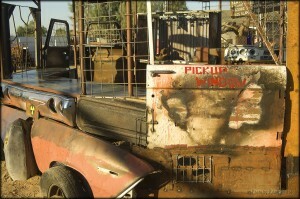 Fenders and a bumper from a 1970 Chevelle and a ’69 El Camino complete the automotive look at the front of the bar. Lighting is a combination of low wattage incandescents, LEDs, and automotive lights (tail lights, headlights, brake lights, etc.). The auto lights have been converted to 120v so that whole bar can be run off of one small generator. There is a bank of car batteries along one wall of the bar, and a mess of automotive wires coming out of them (complete with “high voltage” warning signs), but that’s all just for show, as is the giant switch that is thrown each evening to “power up” the bar (including special sparking wire fx and flicker circuits for that “dirty power” vibe). 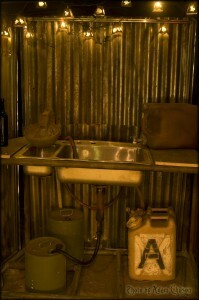 A built in washing station with a stainless steel sink is located off the back bar, and it can be hooked up to plumbing or simply used wasteland-style, with large water jugs and a drain hose out the back. A BBQ grill is also included, to cook up bar snacks like “lizzard soup” and “snake frikisee” (sic). In keeping with the theme, the cocktail menu includes such original creations as the Manhattan Project and the Acid Rain. One signature cocktail (off-menu) is called the Master Blaster. It involves two shakers and one of the bartenders riding on the other’s shoulders. 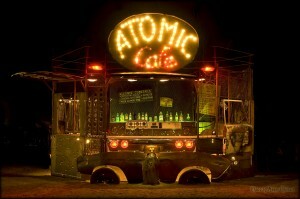 It’s quite a show, but order it when the bar is slammed and the bar backs may just drag you to the Thunderdome. 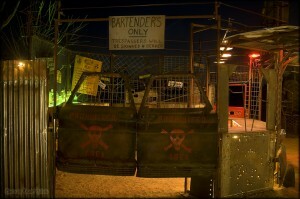 The bar was recently battle-tested at a private party, but will make its public debut at Wasteland Weekend in the Mojave desert on September 27th, 2012. An adventurous roster of pro bartenders has already begun volunteering to get behind the stick. After all, who wouldn’t want to serve drinks at the party at the end of the world? Shake and strain into a highball glass and use an atomizer to spray bitters onto the foam, over a stencil of a radiation symbol. For a Chernobyl Fizz, substitute dark overproof rum for the light rum.